Pilot-testing and field testing sound similar and many recall both to be the same and use them interchangeably. However, there are distinct differences between the two. 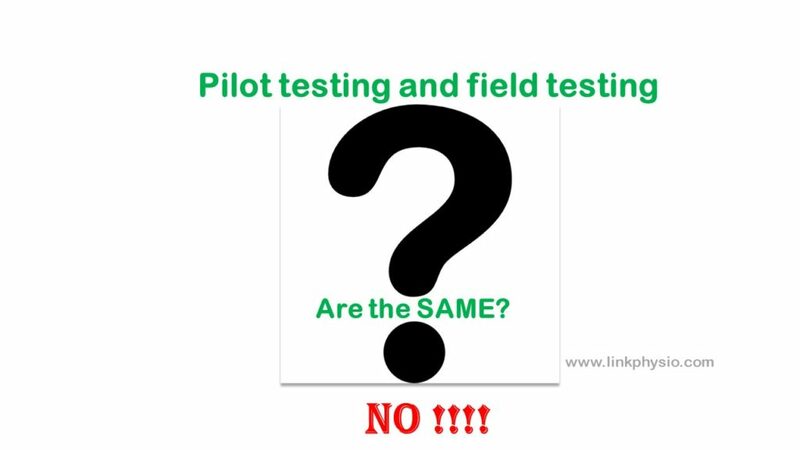 Pilot-testing is a qualitative inquiry on one or more small sample(s) representative of the population. Field testing on the other hand is a quantitative analysis done on a large sample (a few hundreds or more) after one or more pilot testing(s). It is a part of development of an outcome measure with multiple items. It is NOT performed on a single item measure. The general aim of field-testing is to have a better insight on dimensionality of a measure and specifically helps to reduce the items and clustering the items into respective dimension. For example, pain catastrophizing scale (PCS) has three dimensions. Reduction of items from many items to 13 itemed scale, identification of the three dimensions (magnification, rumination and helplessness) of PCS and allocation of every item out of total 13 items to one of the three dimensions (or subscales) was performed during the field testing. Statistical testing such as factor analysis and item response theory (IRT) can be performed for this purpose. I found this book by the authors of COSMIN recommendations extremely useful in understanding the key concepts in development and assessment of reliability, validity and responsiveness (some call it psychometrics and some call it clinimetrics) of outcome measures.